The Centre will build on the City Law School's existing expertise in designing and delivering training for barristers and solicitors. Members will generate high quality academic work to support and inform the development of legal professional practice and training in the future. At a time of substantial evolution in practice, structures and funding, the Centre will seek to ensure that change is properly informed by research and analysis. "Lady Hale's career, which has included professional practice, academic research and judicial appointment, epitomises the diversity of experience that the City Law School strives to encompass. Her most recent appointment to Deputy President of the Supreme Court of the United Kingdom is further evidence of her esteemed position within the legal profession." "The purpose is to enable academic researchers, professionally focused authors, legal practitioners and others to share expertise, and to be able to do so in London, one of the most important legal centres in the world. We believe that enabling practitioners and legal academics to work more closely together can provide substantial benefits, especially at a time of great change and development in legal practice." 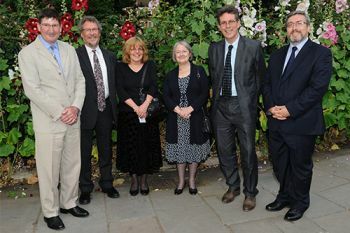 The Centre focuses on key areas of school expertise through the following groups which are led by a team of City academics (pictured, right, with Baroness Hale): Advocacy Forum; Alternative Dispute Resolution Forum; Civil Litigation Forum; Criminal Litigation Forum; Evidence and Proof Forum; The Legal Ethics Forum. A website providing more information has been made public here. The specialist interest groups will help to build networks of academics and practitioners with relevant expertise in each area. 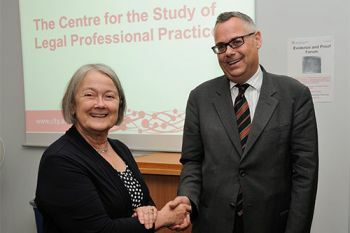 The Centre will also support the growth of expertise in the development of legal professional practice through the recruitment of PhD students, and professionally focused LLM programmes.